This trick is great for showing your friends that you can cut glass with string. The bottom half of the bottle can make a great pencil holder for your desk or just to show off to your buddies. Imagine their faces when you say "I can cut this glass bottle with string!" and then you can prove it. Set a bucket of cold water on a concrete or other fire resistant surface. Rinse out the bottle thoroughly. Wrap the thread around the bottle at the point where you want the bottle to break. (The thinnest area of the bottle is best. If the glass is too thick, this trick may not work.) Wrap the thread around the bottle thirty to forty times. Put on your rubber gloves, in case you get lighter fluid on your hands. Squirt the lighter fluid on the thread, soaking it. Squeeze the thread a bit so it soaks up as much lighter fluid as possible. Wash the gloves with soap and water. Hold the bottom of the bottle with one hand, and light the thread with the other. Turn the bottle on its side a bit and rotate it. If any fluid on your gloves catches fire, dip your hands in cold water immediately. Let the thread burn until it goes out, then immediately drop the bottle into the cold water. If it doesn't break on its own, quickly grab the bottle and apply pressure to the heated area to break the bottle. The bottle should snap, but if it doesn't, you may want to try again. It may take more than one try to break the bottle. Just below the neck, at the widest area, the glass tends to be weakest, so you might want to try to wrap the thread there. You may want to try different thicknesses of thread or string until you perfect this trick, which may take time. Some bottles may also be easier to break than others, so experiment before you show off! Be very careful when working with fire. 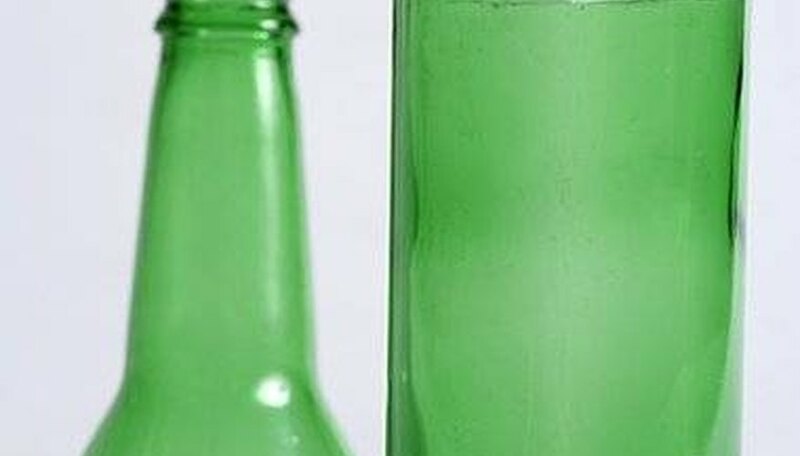 The edge of the bottle will be sharp, so if you plan to use it, you will either need to put something over the edge or grind the sharp edges off, using appropriate tools. From her home in Wisconsin, Catherine has been writing content for a variety of Internet media since 2003. Her areas of writing experience range from baby care advice articles, to zoo animal research papers. Catherine is currently earning her Associates Degree in Communications from the University of Phoenix, and a Career Diploma in Freelance Writing from Penn Foster University.